In the June 2015 issue of SOS I reviewed a Kontakt Instrument from Modwheel called Biscuit Tin Guitar and was really impressed with it for being unusual yet very usable, so I was more than keen to try out three more eccentric releases from Modwheel’s Creative Differences series of products. The three in question, Angklung, Humdrum and The Bends, are all based on acoustic percussion instruments to varying degrees, but are very different from one another in most other ways. An angklung is an Indonesian instrument made by tuning bamboo tubes and suspending them in a wooden frame. Shaking the frame causes the tubes to knock and the result is a woody percussive sound. Modwheel’s virtual Angklung was made by recording 1570 samples of an angklung at 24-bit/96kHz using both contact and stereo microphones. Instead of all the samples appearing in a single interface, Angklung is presented as a set of 23 interfaces, roughly categorised as single hits, rhythms, rattles and effects. All the interfaces are extremely simple and most have no controls other than a reverb level, so the emphasis is clearly on performance rather than programming. The simplest examples are the single-hit interfaces, but really they should be called doubles, because a second ‘up stroke’ sample occurs when a note is released. Naturally, this functionality provides plenty of rhythmical opportunities and it’s even possible to control the volume of the up stroke using the mod wheel. Rhythmic performances can be created using the eighth-and 16th-note interfaces, or the rattle options, of which there are single-note and chord varieties. Further options include flams and effects, some of which were created using non-bamboo instruments apparently made of bones, shells, seed pods and slate. Although Angklung could be used for song production, it’s probably most suited to film and game soundtrack work. 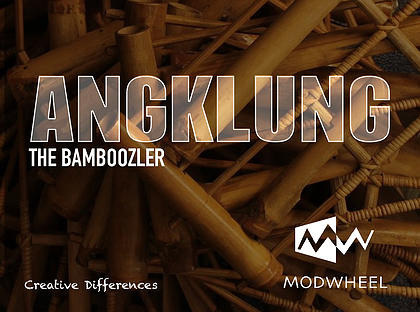 Inevitably, the clunk of bamboo evokes tropical jungle images and the samples work really well when triggered from multiple keys and used to create energetic percussion. Humdrum was created when Modwheel founders David Donaldson and Steve Roche (who have worked as sound designers on many of Peter Jackson’s films) were recording a calfskin bass drum with the intention of turning the samples into a high-quality virtual instrument with a mod-wheel-adjustable ambient room mic feed. Their efforts proved successful, so they decided to carry on and record a whole drum set, including two double-skinned marching bass drums, two snares and large, medium and small toms. The complete Humdrum instrument comprises 3200 samples spread over 12 interfaces, using up to nine round robins and six velocity levels. Each drum is played through its own interface and within each one are various hits, flams, ruffs, rimshots and rolls, some played with mallets, others with sticks. Helpfully, there’s also a page within each interface where there is a list of the keys with which each of these performance attributes can be triggered, so for example, G3 is Rim Flam. Relative to Angklung, Humdrum’s 12 interfaces are busy with controls, but they are still pleasantly simple compared to most Kontakt instruments. To affect the sound, the user can independently control the level of the room and close mics as well as the stereo width, pan position and sustain of the instrument. There’s also a dial for adjusting the speed of flams and ruffs, although its action is quite subtle. The last control is a slider that changes the room mic level and this is mapped to the mod wheel for real-time operation. Although Humdrum doesn’t include any dynamic processing or modulation effects, there is a simple three-band EQ that’s very effective. The last of Humdrum’s 12 interfaces provides a full drum kit, and although not all the performance options of the individual kits are present, there are several of each, including single hits and some roll variations. 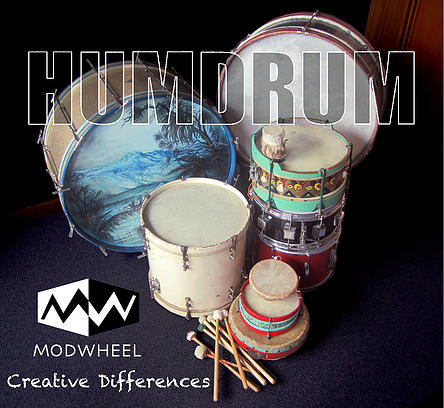 In terms of quality, Humdrum is very good and certainly holds its own when compared to vintage drum kit instruments from other manufacturers. Unlike some of the others though, its design lends itself to score work, where individual drums are often used rather than whole kits. The sounds are warm and soft relative to modern kits, and even after boosting the room-mic level somewhat there’s a curious intimacy to the sound. The Bends is probably the strangest of Modwheel’s three instruments and is marketed as having 30 patches of otherworldly pitch-bends, underwater rhythms and hits. It comprises 750 samples (some of which are a minute long) and makes use of a variety of metal instruments and objects including a triangle, cymbal, talempong, gong, brass plate, barbeque plate, camp oven, cup and vase! All 30 interfaces have identical controls for Echo (time and level), Reverb, Pitch and Shape (Attack and Release), and there is a 32-step arpeggiator/sequencer with controls for pitch, note-order variation, rate, duration and swing. Most of The Bends’ interfaces have velocity-sensitivity assigned to the mod wheel, which is particularly useful when shaping arpeggiating rhythms. 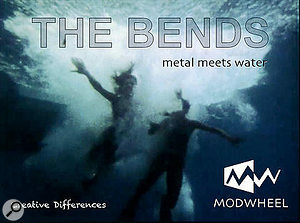 Although The Bends might be of interest to sound designers, it’s not packed with the sort of tool necessary for completely reshaping a sound. Instead, it provides some distinctive and unusual ready-made sounds, ranging from dark and watery to bright and metallic, and enough processing options to tweak them to fit a composition. Angklung $25, Humdrum $55, The Bends $35.